What movie/tv show did you last see? Re: What movie did you last see? There was also quite a cool special effect where Ninjas would seemingly materialise out of shadows cast on the floor and walls. However, computerised blood made it look at bit too much like Mortal Kombat and my Katana mod (story wasn't that dissimilar either -- assassin on the run, hunted by his kin, etc). If you like Ninjas (and lets face it, who doesn't? ), people getting spiked with shurikens, and/or on-screen carnage it's worth watching with a few beers and a few mates. Last edited by Maddieman; 03-05-2010, 05:12 PM. Damn, man. You watched a whole three seasons in a week? I'm also re-watching all the previous seasons in the run-up to the conclusion of season six. It's amazing how much stuff I had forgotten about. It's also interesting to see things which have much more significance in the light of recent revelations; it goes to show that the writers already had the mythology sussed out early on. I stopped watching Lost somewhere in season 2. Now i turn it on by accident and have NFI what is going on and don't care cause it's the same old same old rubbish. Bought David Lynch's "The Elephant Man", haven't seen it yet. It must be great thou! Ha, yeah, I did. I don't really have a lot to do at the moment. But remember only because i liked it, dosent mean you gonna like it. Im gonna watch RockRolla i got for christmas by my friend. Havent watched it yet . Is it good? I haven't seen it yet, although I have the Blu-ray sitting on my shelf waiting for the return of my headphone amp. I hear it's outstanding, but also one of Lynch's most conventional films. I really like WW II theme( Specially the events of Stalingrad battle), So I'm about to start " Band OF Brothers". I've seen it a couple of times. It's fantastic, but not easy to watch. John Hurt and Anthony Hopkins are outstanding. It's a great movie, every AC fan should see. A great portion of it is captured against green screen and there are very beautiful scenes in it. 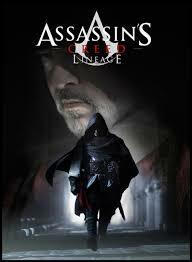 The story is a prequel to the video game Assassin's Creed II. It centers around Giovanni, the father of the game's main character Ezio. I'd better get another two parts asap. ..Huh? The whole thing has been up since game release. Watched Schindler's List last night. I swear, everything Liam Neeson is in, he makes me cry. I love you, Liam Neeson. My Fallout 3 father. Yeah, I mean I only have part 1. My friend has the others in HD and I'll get them today. I watched Schindler's List long ago and I liked it. What do you think about that little girl in red dress while the whole movie is black & white?